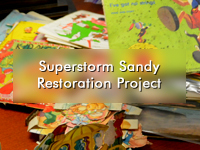 In April, 2013, Peter Muldavin, a leading expert on vintage American children’s records, donated 786 vintage children’s records that had been damaged in October 2012 by SuperStorm Sandy. Storm surge entered the Long Island garage where the recordings were leaving dirt and mud on the records and jacket covers mildewed and stained. Requiring both modern computer software and old-fashioned elbow grease, The Recorded Sound Archives embarked on a project to clean and repair the damaged records. Despite the dirt, mold and mildew, library staff was able to salvage most of the story books and paper doll cutouts that accompanied the records. Adobe Photoshop was then used to restore scanned images so that they could be viewed damage-free on this website. 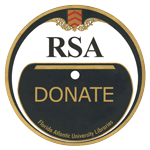 This online collection exhibits slightly less than half of the donated recordings. This collection of children’s music was produced mostly during the1940s and 1950s, a time when vinyl replaced hard shellac as the basic material used in the making of phonograph records. The innovation of vinyl allowed manufactures to produce kid-friendly recordings that could be handled without adult supervision. These recordings became an extremely popular form of entertainment for children in the days before families had television sets. See also Vintage Children’s Records. Higitus Figitus / What Did Merlin Ever Do?